This Raspberry cultivar is an Autumn bearing variety and yields an abundance of juicy sweet berries from August - Oct . It tolerates shade and will fruit well on the sun side under fruit trees. The spring shoots are also edible and the leaves can be dried and used as a tea substitute. The plant is attractive to bees and being vigorous plant provides a good amount of mulch material and/or animal fodder when pruning time comes around. To order this plant please contact us balkanecologyproject@gmail.com. In flower from May to September, and the seeds ripen from June to October. Suitable pH: acid, neutral and basic (alkaline) soils and can grow in very acid and very alkaline soils. Plants send out new shoots from underground stems called stolons. These can be dug up and transplanted. 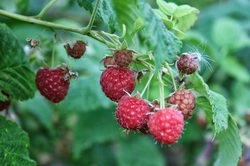 Summer-fruiting raspberries, which are ready for harvesting in early summer are also available.